by J. Harvie Wilkinson III. New York, NY: Oxford University Press, 2012. 161 pp. Hardcover $21.95. ISBN: 9780199846016. Reviewed by Zachary Baron Shemtob, Department of Criminology and Criminal Justice, Assistant Professor, Central Connecticut State University. Baronshemtob [at] gmail.com. Throughout Cosmic Constitutional Theory, Judge J. Harvie Wilkinson III praises the virtues of judicial self-restraint in what he sees as an age of pernicious activism. Though Wilkinson’s lament is nothing novel, he finds a unique source of blame: According to Wilkinson, unified constitutional theories of interpretation have enabled unbridled judicial discretion, allowing judges to mask ideological decisions under the guise of neutral principles. While Wilkinson explicitly rejects constructing his own theory, he seems to inadvertently endorse a form of restrained pragmatism. As a judge on the United States Court of Appeals for the Fourth Circuit, J. Harvie Wilkinson III has certainly practiced the restraint he preaches. Wilkinson’s restraint-based forefathers argued that judges should only strike federal or state legislation clearly unconstitutional, or statutes neither rooted in the founding document’s explicit text or its succeeding history (Thayer 1893). Indeed, according to a recent study, Judge Wilkinson has upheld more legislation than almost any other circuit court judge, refusing to show favoritism based on either a measure’s liberal or conservative nature (Yung 2011). Perhaps more striking is Wilkinson’s condemnation of both the Supreme Court’s decisions in the liberal Roe v. Wade and the more conservative District of Columbia v. Heller, as well as his admission that, while he may be uncomfortable with it as a matter of policy, Wilkinson believes the Affordable Care Act’s individual mandate is constitutional (Wilkinson 2012). In this short book, Justice Wilkinson chastises his brethren for their refusal to bow to the legislature, arguing they have fallen for so-called “cosmic constitutional theories.” Such theories do not consider judges’ limited role in a larger system of checks-and-balances, but seek to unlock a single method of constitutional interpretation. Like in Euclidean geometry, cosmic constitutional theorists believe in one correct answer, or that the right formula will yield the right ruling in virtually every single case. According to Wilkinson, such theories are not only internally inconsistent, but undermine democratic rule itself, allowing judges to substitute their own policy preferences under the mask of supposedly mechanistic reasoning. Wilkinson’s first target is the diverse doctrine of living constitutionalism (known in some quarters as popular constitutionalism), or the idea that judges should implement the “contemporary values of the American people” when deciding constitutional issues (p.12). Wilkinson praises living constitutionalism’s recognition that the [*163] Constitution cannot simply be frozen in time. Nevertheless, he criticizes the arrogant assumption that nine cloistered lawyers can properly gauge American interests. According to Wilkinson, “[i]n its pure form, living constitutionalism” is a form of “paternalism, premised on the belief that very few know what is best for very many” (p.32). Wilkinson next turns his sights on originalism, perhaps the most simultaneously praised and reviled cosmic constitutional theory in recent legal history. Wilkinson seems to find more value in this theory than in living constitutionalism. By treating the “original public understanding of the Constitution as the only legitimate source of constitutional interpretation,” originalists offer both a coherent defense of democratic legitimacy and a (seemingly) natural constraint on judicial [*164] decision-making (pp.38-39). Sadly, however, Wilkinson believes originalism falls into its own partisan trap: Since the historical evidence is frequently unclear or can reasonably support either side of an issue, orginalists often must rely on their own ideological discretion. According to Wilkinson, the jurisprudence of Justice Clarence Thomas, perhaps the foremost example of strict originalism, illustrates this problem. In McDonald v. City of Chicago, for example, Thomas advocated resurrecting the privileges and immunities clause in order to implement a host of unenumerated rights that legislatures would be forced to recognize. As Wilkinson remarks, “If originalism can turn its most avid followers into activists, then no one is immune” (p.50). Wilkinson dedicates his next chapter to debunking John Hart Ely’s political process theory, which, while greatly respected in academic circles, has largely failed to catch on in the (at least contemporary) courts. Ely advocated that judges focus on process rather than outcome, and show special regard for allowing minority groups into the political decision-making process. As with living constitutionalism and originalism, Wilkinson appreciates elements of Ely’s theory, and especially his attempt to enable representative democracy to better function. Ultimately, however, Wilkinson argues that process and outcome are inherently linked: Encouraging judges to interfere on process theory grounds, or to actively decide “what democracy itself should look like,” grants them far too much legislative power (p.71). 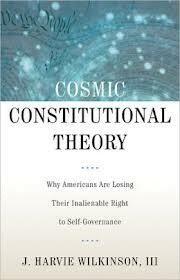 Wilkinson’s final cosmic constitutional theory, pragmatism, actually portrays itself as a sort of “anti-theory” (p.80). According to judicial pragmatism’s founder and chief advocate, the venerable Richard Posner, the ideal judges are not (ultimately) bound by text, precedent, or political process, but should base “judicial decision[s] on the effects” such “decision[s] [are] likely to have” (p.82, quoting Posner). Pragmatic judges must consider the greatest public good, regardless of their own personal policy preferences. Posner argues that wise pragmatists will naturally practice self-restraint, knowing that “transferring … law-making authority to unelected judges” can threaten the court’s own institutional legitimacy and give command of complex problems to unequipped actors (p.83). While Wilkinson praises pragmatism’s flexibility and candor, his critique should by now be obvious: By urging judges to act for a nebulous public good, Posner offers no actual constraint on judicial decision-making. According to Wilkinson, pragmatism “either encourages judges to attempt the impossible feat of balancing all relevant interests,” or helps them to justify their preferred case outcomes (p.91). Wilkinson finishes by refusing to endorse a theory of his own. Rather, he claims that, by embracing unified theories of interpretation, judges have forgotten that “wisdom lies simply in knowing the limits of one’s knowledge” (p.115). As Wilkinson concludes, it is the legislature and not the judiciary’s role to pass laws, and judges should only overturn those having no tangible relation to the “language, structure, and history” of the Constitution (p.115). I must admit having great sympathy for Judge Wilkinson’s position. Though I am skeptical that our current democracy produces optimal (or even adequate) outcomes, I doubt that an aristocracy of nine unelected lawyers would do much better. (Although given his prudence, ability to see both sides of complex issues, and intellectual honesty, nine J. Harvie Wilkinsons might be an exception.) Indeed, re-embracing the judicial conservatism of Felix Frankfurter and John Marshall Harlan would offer a valuable corrective to a Supreme Court that more often seems ideological than truly judicious. Yet a contradiction lies at the heart of Cosmic Constitutional Theory. This is in Wilkinson’s refusal to recognize that he does, and indeed must, offer his own theory. After all, practicing judicial restraint is only possible if one has some criteria for when judges should declare statutes unconstitutional. Practitioners of restraint may use different measures here, from Holmes’s “reasonable man test” (upholding all reasonable statutes) to Felix Frankfurter’s more precedent-based jurisprudence (upholding statutes even minimally rooted in some sort of precedent) (Shemtob 2011). Despite his protestations to the contrary, Wilkinson is no different; however inadvertently, he cannot escape offering a theory of his own. This comes in the context of Brown v. Board of Education, an undoubtedly activist decision almost universally recognized as proper. Wilkinson fully acknowledges that the Brown decision did not enjoy clear textual or historical support. Nevertheless, like the equally activist Gideon v. Wainwright (incorporating the sixth amendment) and Miranda v. Arizona, he praises the Brown decision for vindicating “foundational principles essential to the functioning of our nation” (p.111). Ironically, Wilkinson’s loose theorizing results in a tacit endorsement of pragmatism, or that judges should consider the long-term effects of their decisions. (Indeed, few long-term concerns are greater than maintaining those foundational principles critical to our nation’s very functioning.) Regardless of his fervent denials, Wilkinson thus falls perilously close to implicitly embracing a theory he previously derides as “judicial guesswork” (p.96). Though Wilkinson fails to escape the tangled web of theory he so criticizes, on the whole, I found Cosmic Constitutional Theory a thought-provoking book, and one that I would gladly recommend to anyone who scoffs at the notion of the non-partisan judge. Wilkinson (in both word and practice) has done a fine job defending a concept too often used as a buzzword for one’s personal predilections. Furthermore, Cosmic Constitutional Theory provides a lucid (albeit brief) analysis of our leading constitutional theories and where they fall short. Each page reflects a fierce and open intellect, respectful but never afraid to delve deeper. While it might have led him to admit there was no “escape from theorizing” (p.115), our nation is poorer that J. Harvie Wilkinson III does not sit on its highest bench. Shemtob, Zachary B. 2011. “Following Thayer: Judicial Restraint’s Many Variations.” Boston University Public Interest Law Journal 21: 1. Thayer, James B. 1893. The Origin and Scope of the American Doctrine of Constitutional Law. New York: Little Brown. Wilkinson III, J. Harvie. 2012. “Cry, the Beloved Constitution.” March 11, 2012. The New York Times, A21. Yung, Corey R. 2011. “Flexing Judicial Muscle: An Empirical Study of Judicial Activism in the Federal Courts.” Northwestern Law Review 105: 1. © Copyright 2012 by the author, Zachary Baron Shemtob.